My plan was to complete the whole unit of eight bondi before the end of the month, but that's just not going to be possible now, so I thought I would photograph another pair rather than wait even longer for an update. 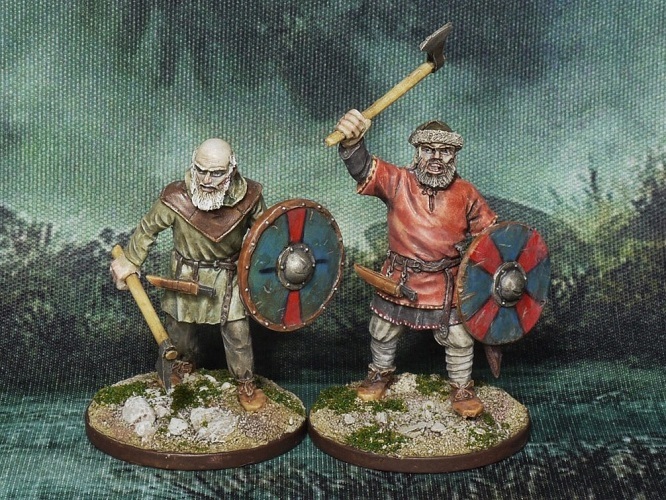 So here we are, two more of the V&V Miniatures vikings. The younger warrior sports a shaven head, I have added some tattoos to the exposed skin, but you cannot really see this from the front. He also has a little fancy embroidery on the collar of his tunic. The second warrior is a more unusual pose, wielding his spear in a two handed grip with his shield slung over his shoulder. He also wears a padded tunic, which I have seen some objections to on some parts of the internet as it's generally regarded to be a post viking era garment. My own view is that we know so little for certain about the appearance of the vikings - their clothing, their hair, shield designs, etc. The little "evidence" we have is related (often by their foes) decades or centuries after they were around, so hardly reliable, factual witnesses. It seems to me unlikely that they would not have padded their clothing to give some protection. Whatever the truth, this toy soldier is wearing a padded tunic. 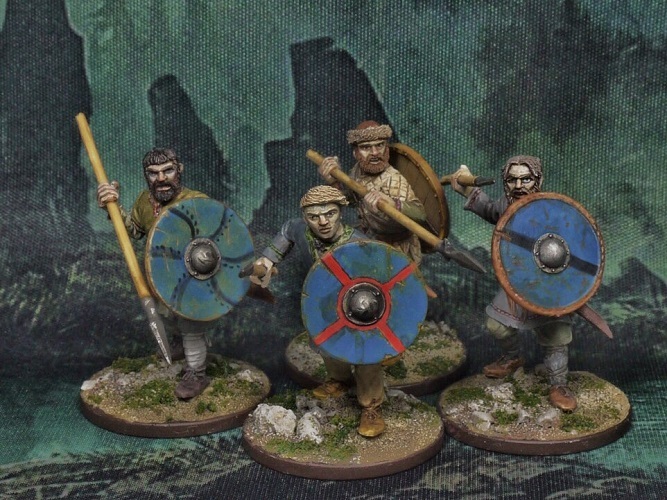 I took a photo of the four spear armed bondi in a miniature shield wall, it's a nice little diorama. I have chatted to a few re-enactors who have said that it's likely the warriors acted in pairs or teams, with one providing protection with a shield while his comrade stood behind thrusting a spear. We will never know if this is true or not, but it does look good. You might be thinking that there is a Gaelic vibe to these figures, with the darker hair colours and the plaid of the cloak. I suppose most people think of vikings as Scandinavian in origin. While it's true that they did originally set sail from northern Europe, many settled in lands they had raided. In England, a large contingent settled in the east and north of the country, forming what would later become known as the Danelaw. There were also sizeable colonies in the Scottish islands, the Isle of Man (off the west coast of northern England), and famously it was viking settlers who founded the Irish city of Dublin. 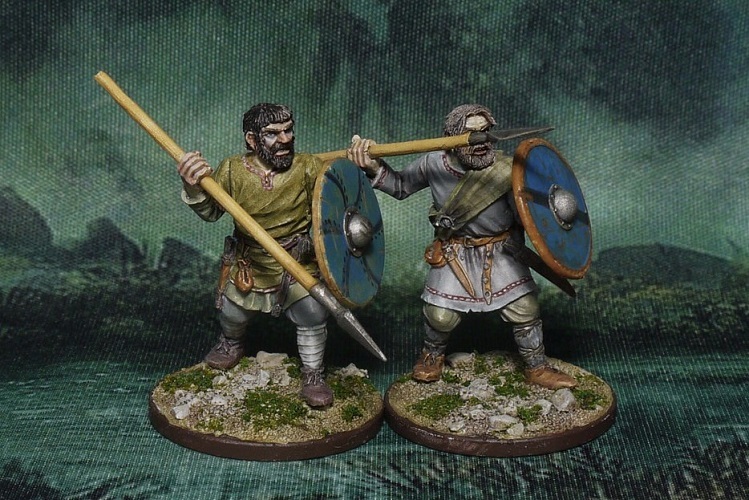 It was these I had in mind when painting these figures. 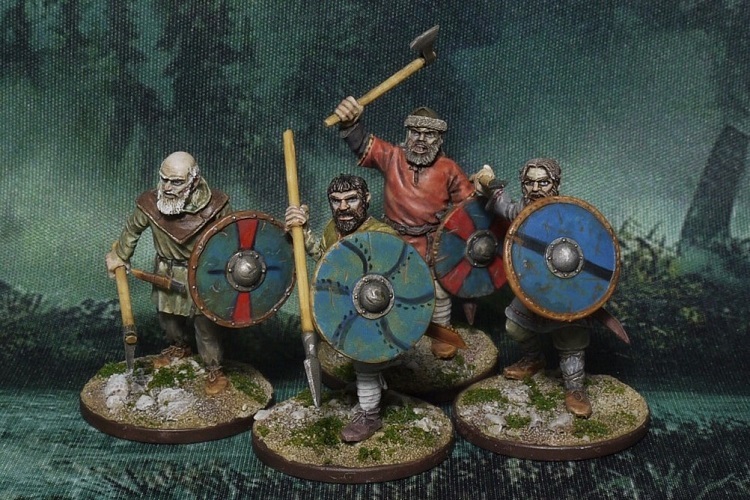 Once settled, it's likely that the vikings would have adapted to their new culture, in order to be accepted by the locals, and one way to fit in is by wearing their clothing. In addition, there could easily have been recruitment of local Irish/Gaelic stock into the ranks too - voluntarily or otherwise. So it's perfectly feasible (in my mind) to have viking troops not exactly fitting the usual blonde Norse stereotypes. Of course, we have no idea what they looked like anyway, most of our pre-conceived ideas come from later medieval artwork and Victorian romanticism, but that's another post for another day. With these two figures added, the unit now totals four bondi - half a point in Saga terms. I was hoping to have the whole unit done by the end of the month, and I am still just about on target. I am quite busy at the moment and with the festive season approaching I suspect hobby time will diminish, but I will keep plodding on, "little and often gets it done" is my mantra. If I don't manage to hit the deadline, it's not a big issue. After all, Rome (or even Dublin) was not built in a day. A pair of bondi completed. 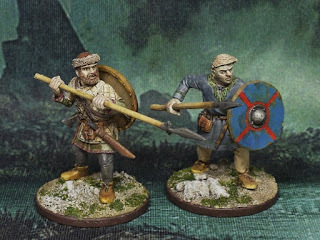 These are the V&V Miniatures I have been working on for the past couple of weeks. As you can see, they are packed with detail and have lovely proportions. I have set myself a loose target of completing them by the end of the month, so getting two done now means I am on target. The figure with the hat took me longer to complete. I painted some trim on his tunic and his shirt. I got this idea from visiting re-enactments, where often viking women are sat in tents making these "ribbons" from wool. It seems an easy thing to do, so I reckon most warriors would have these little extras on their clothing. I also painted stripes on the trousers but they are hard to see, I need to be a little bolder in colour choice at times. The bare headed figure I intended to paint in a pale, neutral tone, to represent unbleached fabric. But the original shade was too blue, so I glazed over it with yellow and ended with a green grey mix. The shading is a little too contrasty for me, I prefer more subtle tones. The leather shoulder pads I think I may have misinterpreted the sculpt. Looking at photos from re-enactments I think it was intended to be a cloth hood. I assumed it was leather to give some basic protection to the shoulder areas. I do like the head though, this old boy is full of character.